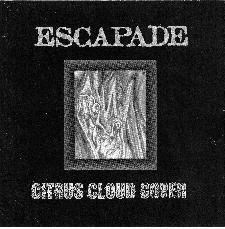 Escapade - "Citrus Cloud Cover"
On the back of the CD case Escapade proclaims: "All Escapade music is composed spontaneously and collectively. No overdubs are utilized". An appropriate phrase indeed as the band's improvised music more often than not does seem well thought out, if not actually composed..
Escapade is a five piece and on this 2-CD set consists of Paul Hilzinger and John Ortega on various keyboards and synths, Joey Murphy on bass and percussion, Paul Casanova on guitar, electronics, and percussion, and Hadley Kahn on drums and percussion. Though firmly in the space realm, Escapade is more like a fusion band that got turned on to Hawkwind while listening to the likes of Miles, Sun Ra, and King Crimson. The band plays extended improvs that come across not so much as jams than as continuously developing ideas and themes. The music can be abstract at times but is always accessible. Some highlights include: "Undermine" and "Overmine", together totaling about forty minutes, were both recorded during the Orion SpaceRock Festival in October '97. "Undermine" features a slow exploratory jazz journey that becomes a bit of a jazz-psych freakout. This may be a stretch but the guitar at one point reminded me of James Blood Ulmer, an interesting effect combined with all the swirling synths. The music eventually calms and the musicians play away seemingly independent of one another, though the result is neither confusing nor chaotic. I guess that's what good improvisation is about! "Overmine" is another cosmic fusion workout that prominently features the synths and percussion. Both concentrate on steady theme development and the guitar almost works like a synth in parts. One of my favorite tracks is "It", a dark, somewhat avant-rock, King Crimson/Univers Zero-sounding piece. The bass has an extremely low zheul-like sound that gives the music a Magma feel. Of course the electronics help keep the whole thing in orbit placing Escapade in their own little corner of the SpaceRock domain. "Turtle Chase" is far more ambient than the rest of the tracks. Spacey, but still with jazz and avant touches, this is like the soundtrack to a sci fi movie in which the action is driven by the music. The tune ends with a pounding rock bass and a mini synth freakout. Similar to this is the thirty minute "The Sunlight Hurts My Eyes". On my first couple cursory listens to this track I felt that the ideas had been played out long before the music ended. But closer listening reveals what really could have been a composed work. Truly a space symphony that takes the musical scenic route. Highly recommended to space fans who like improv, jazz, and creatively adventurous instrumental music. You can visit Escapade at their Mother West Records web site.